SWEATSHOP is a literacy movement (opens in a new window) devoted to empowering marginalised communities in Western Sydney through the development of critical consciousness and creative outcomes. 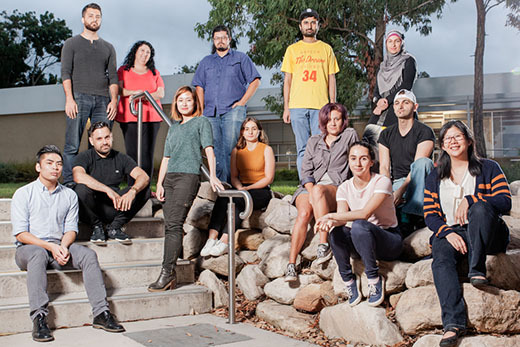 SWEATSHOP is based at the Western Sydney University, Bankstown Campus, as part of the Writing and Society Research Centre, and is run by a collective of culturally and linguistically diverse arts practitioners and award-winning authors. SWEATSHOP supports marginalised communities and individuals to identify issues that affect them, take control of how they are portrayed and perceived and to build alternatives through artistic endeavours such as writing, performance, visual art, photography, audio engineering and film-making. Our programs encourage and train participants to create literature and art specific to their experiences and identities, as a way of reclaiming and giving voice to underrepresented and misrepresented Australian narratives. SWEATSHOP initiatives result in publications, films, podcasts, plays, performance readings, exhibitions, and arts and cultural seminars. These projects are often produced in partnership with groups and organisations which include: WestWords, Giramondo Publishing, Bankstown City Council, NIDA, PYT, BMYS, Urban Theatre Projects, Seizure, ALNF, SBS, Shopfront, NSW Writers' Centre, Sydney Writers' Festival, Melbourne Emerging Writers' Festival and Alice Springs Eye of the Storm Festival. An initiative of SWEATSHOP, WestWords and the Writing and Society Research Centre, the Western Sydney Writers Group is an ensemble of emerging and established writers and artists from Western Sydney who collaborate on a range of literary projects and events and meet fortnightly to develop and critique new creative writing. These fortnightly workshops are held at the University of Western Sydney, Bankstown. If you would like to join the Western Sydney Writers contact SWEATSHOP. SWEATSHOP publications aim to build the profile of Western Sydney writers and artists and to produce new Australian literature that represents the unique diversity and culture of Western Sydney. These are produced independently or in partnership with other publishers and organisations. SWEATSHOP offers many publications that are free and available to read online, and some that are available for purchase. You can check out a list of all our publications, read free books and samples, and even access free education kits here.